In the world of global music, it is hard to make a bigger splash than the arrival of the Yoshida Brothers, a Japanese musical duo that has taken their own country, and now the world, by storm. Their music has roots in Japan's past, but the siblings' sights are set on taking Japanese music into the future. The two brothers, Ryoichiro and Kenichi, make concert appearances in traditional Japanese dress – kimonos and hakama pants. Their instrument is the shamisen, a large three-stringed instrument featured in the Japanese music of earlier centuries. The style of music they play is Tsugaru-Shamisen, a style that is indigenous to the north of Japan. At the same time, their approach to fashion and music is also very modern. The brothers sport the spiky haircuts and hair dye associated with pop stars. And their style of playing the shamisen pushes the instrument's possibilities from traditional music into the realms of jazz, experimental music and rock'n'roll. 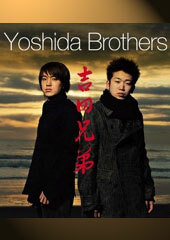 Their record, also called Yoshida Brothers, is a brash experiment of sound. On songs such as "Labyrinth," the delicate interplay between the two brothers and the vast spaces between notes echo traditional Japanese music and the compositions of the European and American avant-garde. At other moments, the duo swaddle the shamisen's prickly notes in the ambient sounds of synthesizers ("Starting on a Journey"), or veer close to the verve of rock'n'roll and soul ("Madrugada"). The Yoshida Brothers take stylistic gambles with the limits of the tradition that they inherited. These wagers pay off handsomely on songs such as "Storm" and "A Hill With No Name," in which instruments including piano, violin and tin whistle provide strong counterpoints to the shamisen. Despite their penchant for experimentation, The Yoshida Brothers' music is rooted deeply in the country's traditions. Those traditions have some interesting and unlikely roots. For instance, the shamisen originated not in Japan, but in China. It traveled to Japan via the island of Okinawa, where it arrived in the 14th century. Very quickly, the three-stringed instrument was adapted to Japanese idioms. The lute was made larger when it traveled from Okinawa to Japan, and it was played not with the fingers but with a pick known as a "bachi." The shamisen soon became a mainstay of Japanese folk music, much as the guitar is in U.S. folk music. Though musical styles changed, the shamisen maintained its exalted place in Japanese music. In part, the distinctive musical style was preserved to our time by the tight controls exerted on education and certification by Japanese professional associations, known as "iemoto." As the 1980s and 1990s dawned, these traditional classifications began to break down. New artists began to test the boundaries of classical folk styles and add in new instruments. The fruit of the labors of performers such as Kinoshita Shin'ichi and Takio Ito – who pioneered such improvisations – is blossoming now in the music of the Yoshida Brothers. Music of various cultures bounces all over the globe these days. Bombay's banghra meets Brooklyn's hip hop. Buenos Aires' samba collides with Berlin's techno. The music of the Yoshida Brothers – mixing Japanese tradition with Western pop – provides yet another example of music's ability to bend to win global applause. The duo also provides an example of how music, though it can bend, does not break with tradition. The history and tradition that echoes through the Yoshida Brothers' sound proves that even the most global music is rooted in local soil.